I was looking for a backyard patio product and came across this interesting product. What definitely sold me was the price of the product! Overall, the product was easy to set up and my kids love it. The saucer is very spacious and fits two kids. Sturdy and nice. Spend a relaxing day in the Deluxe Saucer Swing by Sportspower! 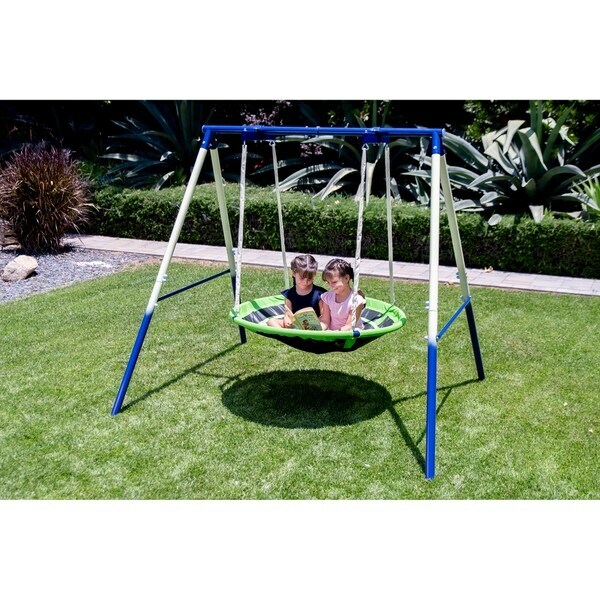 Relax and hang out in the large 45-inch diameter patented saucer swing. The durable steel frame is powder-coated to resist rust for long lasting use. UV-resistant PVC protective sleeves cover the swing chains to protect children’s fingers and hands from getting caught. The Deluxe Saucer Swing is built with a four-point chain design that provides more product stability compared to two-point chain designs that are more susceptible to tipping. With the Deluxe Saucer Swing by Sportspower, anyone can enjoy relaxing, playing and swinging in the comfort of their own backyard. Dimensions 70.0 In. X 86.0 In. X 73.0 In. This was easy to put together. It took my husband and myself approximately an hour. The grandkids like it. I also think it is safer then a traditional swing. I would purchase this item again. This came together easily, but I needed my 6' 2" son to help me. All 3 of my boys were able to fit on it. So far so good.